If a tree “eats” CO2 and produces oxygen it is easy to understand the importance it has in reducing the concentration of carbon dioxide produced by our activities. 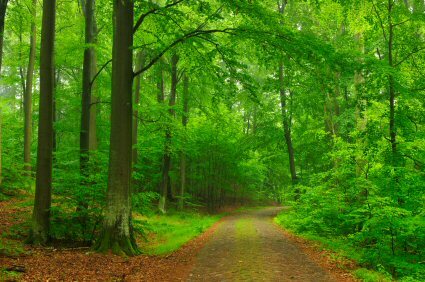 Therefore trees, besides cleaning the air, help to decrease the greenhouse effect generated by the constant increase in CO2. Just think that a 100 year old beech tree “eats” 2.5 kg of CO2 every hour, and frees 1.7 kg of oxygen in the air, equal to the oxygen that 10 people breathe. During this process there is transpiration of a remarkable amount of water, and in this way the microclimate is improved, it is as if we were “cooled” by 5 air conditioners working uninterruptedly for 10 hours! By planting 10 walnut trees, the greenhouse gas emissions generated by our house are absorbed, while 19 trees are necessary to balance the CO2 produced by 2 of our family cars. Obviously this can only work for small quantities; in fact an entire nation cannot absorb all its CO2 by only planting trees!. In fact Italy emits 670 million tons of carbon dioxide a year, and therefore we should plant 1,340,000 sq. km. of woods of walnut trees, 4 times the size of the area of Italy. A small but very important gesture, for the environment is however to plant a number of trees that is necessary at least to cover our personal production of CO2. You can also carry out many more actions to make the difference! In order to learn how you can individually contribute to the well-being of our planet, carrying out small daily actions, refer to our page of advice to avoid polluting.